The bus turning circle just off Tooting High Street is not a place that would usually inspire carnival, creativity and dancing in the street. Usually it is home to buses, often idling their engines right next to the homes of the people who live overlooking it. On the other side, opposite the houses, is a huge Primark, with a huge, long, rather dull wall. As I say, not a place that would usually inspire great creativity, but that was until members of Transition Town Tooting started to look at it through their ‘Transition glasses’. 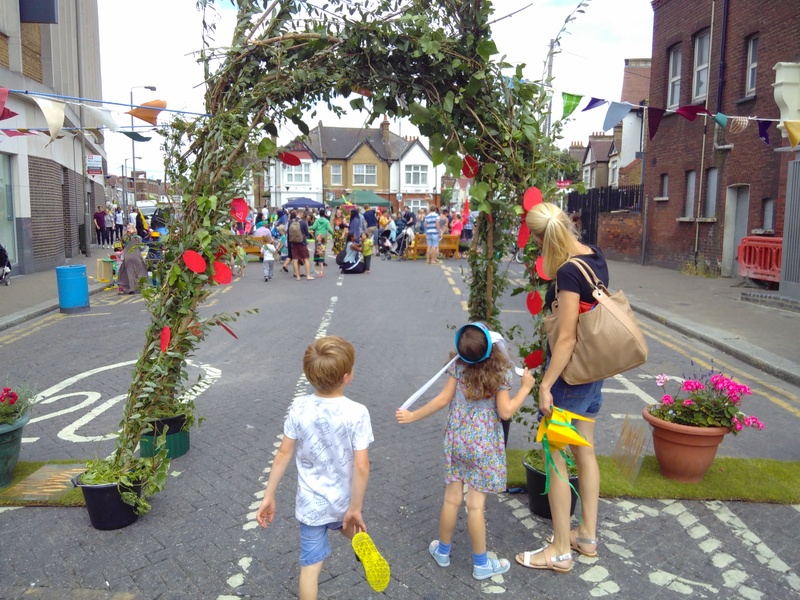 Last year, they held the ‘Tour de Tooting’, an event which brought out hundreds of people in a celebration of the wheel: decorated bicycles, prams and buggies, anything with a wheel was welcome, and the more colourful the better. The Tour passed through the bus turning circle, which had been cleared of buses for an hour, and the experience of seeing it through new eyes, inspired the idea for this year’s event. The street as a gallery for chalk art. One of the most powerful threads in Transition is “what would happen if?” The Tooting Twirl created the space for people to ask “what would happen if this turning circle were, in fact, our village green?” Tooting is a place that lacks a centre in that way, being largely strung out along the High Street, but if there were one, it would be this circle. And so last Sunday, having crowdfunded nearly £2000, and with a team of volunteers, this circle was transformed into a ‘twirly’ village green. The buses went elsewhere for the day (just down the road), and out came all manner of benches, a kind of speakers platform/viewing platform which was adorned with plants and became a great place to have your photo taken, strips of actual grass rolled out onto the road, trees in pots, bunting, and a beautiful arch for people to pass through as they entered from the High Street. There was music from a ukulele band, some amazing Sikh drummers, and from anyone who wanted to play the instruments that were available. There were wheelbarrows full of plants and twirly windmills. The Neighbourhood Plan group were there, as was Dr Bike, fixing peoples’ bikes free of charge. There was free food from a local restaurant. The newly-elected MP for Tooting, Rosena Allin-Khan, dropped by and gave a short speech. There was a twirly parade, in circles around the turning circle, led by the Sikh drummers. There was a pedal-powered zoetrope, for which kids could make drawings which they could see come to life. People responded by sitting down, having conversations, joining the parade. Children started to play in the street. Spontaneous games of Four Square and hopscotch began, and one girl started to get different people to lie down on the road (a suicidal thing to do on a normal day) where she then drew round them in chalk, like a colourful crime scene. Chalk drawings started to spread out along the road. I was reminded of the words Jo Chesterman, a mother on a street in Fishponds in Bristol I visited a few months ago where the street was regularly shut for kids to play in, “traffic just needs to be put in its place, and then this happens”. “I don’t think it’s possible for anyone who’s been here today or walked through it, or walked past it, to not see this space a bit differently. Once you’ve seen it without the buses and you’ve seen it like this, it’s planted in your mind … I don’t see how you could go back from that”. “What we have today is evidence. Evidence that things are possible. We have people’s memories, and people’s experiences, which would all be playing out in their imaginations about “what I did yesterday when I went to the Tooting Twirl”. We set ourselves to the expectation of change – once you’ve created that then ideas get seeded in people’s imaginations, and then, maybe, when a proposal is made, no-one can say it’s not possible. It is absolutely possible to move the buses. We’ve done that. The joy and the delight of this is to step forward a bit, to be a little bit daring and a little bit courageous, saying “well, what if? What if we did that?” We have just played with that idea of what could be possible. But let nobody say after today that it’s not possible”. Viewed through these new glasses of possibility, the long wall of Primark, which normally you would pass by without even noticing it, becomes the potential venue for an amazing mural telling the story of the history of Tooting. That wall. What I think is commonly referred to as a “blank canvas”. I took off my shoes and socks and felt the (albeit temporary) green green grass of Tooting between my toes. I remembered Lucy telling me how after the 2010 ‘Trashcatchers’ Carnival’ there was a public meeting to reflect on lessons learnt. During it, one person said “if we can do that, we can do anything”. That spirit is alive and well in Tooting, and after this glorious day in the sunshine, surrounded by laughter, play, music, the smells of delicious food and Ethiopian coffee, and the many twirls of lots of twirly things, it felt entirely possible that in a few years I might return here to visit the newly-opened Tooting Village Green. And I’m sure that that will be an even bigger, even more colourful, event noisier afternoon. Congratulations to all the organising team, who I hope are getting a very well-deserved Monday off! Was great to see you too Shaun. I miss the spirit and expression of community that I knew when I was organizing Earth Day and Transition Town events. It was so fun to bring the parts together into one dynamic whole. Yes, the whole is more than the sum of the parts. Like a forest. Like a garden. Like an orchestra or even a constellation. And…like a Transition Town of many colors, sounds and shining stars. Though I am working with different parts now I continue to appreciate the “creative genius of community” when I see it. Thanks for the view, Rob.